Fold up your die drawings in Illustrator! Put your die drawing in a separate “origami” layer. Leave the other artwork asis. Set cut lines to be solid, crease lines to be dashed. Set up folding angles and mark the bottom part. That’s all! Now enjoy the 3D preview of your layout. Save the image or export the 3D model for further processing. Requirements: Adobe Illustrator CS6 – CC 2018 running on Mac OS X. 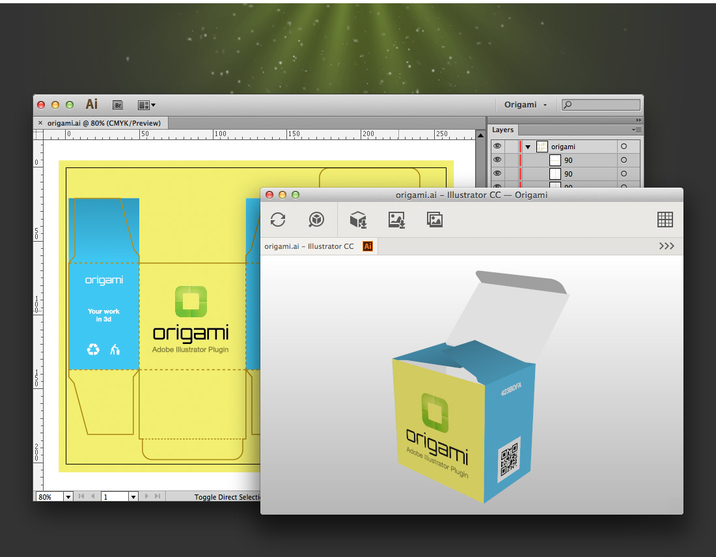 The changes are mostly about the dieline generator window of Origami. Inches are now properly set up as documents units when a new dieline is generated. It worked for all the units, except inches before now it is fixed. We also improved CSV support in batch dieline generator. Decimal point rounding has been improved in dieline generator both in manual and batch modes. Origami now displays 4 digits after the decimal point, which is good for inches. Finally, we ported the OpenGL driver selection from Boxshot, so if Origami doesn’t detect the best GPU driver for your system well, you can always help it in the Settings window. This is a Windows only feature, as OpenGL drivers are more predictable on Mac.